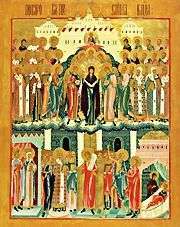 The Feast of the Protection commemorates the appearance of the most holy Theotokos in the Church of Blachernae in Constantinople in the tenth century, as recorded in the life of Saint Andrew the Fool for Christ's sake. While the multitudes of the faithful were gathered in church, Epiphanius, the friend of Saint Andrew, through the Saint's prayers, beheld the Virgin Mary above the faithful and spreading out her veil over them, signifying her unceasing protection of all Christians. Because of this we keep a yearly feast of gratitude, imploring our Lady never to cease sheltering us in her mighty prayers. Share the feast of The Holy Protection of the Theotokos with an icon greeting ecard.